Paramahamsa Yogananda was a practitioner of Kriya Yoga who recorded his spiritual journey in the classic work "Autobiography of a Yogi". He was born in Calcutta in 1893. His autobiography was first published in 1946, twenty-six years after he was instructed by his Guru to leave India and go to America to spread the teachings of Kriya Yoga (literally, the Yoga of "ritual action"). "Little mother, thy son will be a yogi. As a spiritual engine, he will carry many souls to God's kingdom". Another unusual event she recollected occurred when an unknown monk came to her door and told her she did not have much longer to live. He then explained to her that an amulet would materialize in her hands during meditation and that she should make sure that her son Yogananda was given the amulet a year after her death. Yoganda describes how "a blaze of illumination" came over him and how "many dormant memories were awakened" when he was given the silver amulet by his brother, who explained to him its significance. Yogananda believed the amulet was a gift from teachers in his former lives who were "invisibly guiding" the course of his current life. Yogananda's writings document his early life in Calcutta, his college days, his efforts to visit the Himalayas to find a teacher, his meetings with various saints, his finding a guru at age seventeen, and finally his becoming a monk. Later in life, he founded a school in Ranchi, Bihar, based on yogic principles. He later went to live in America for many years. There he lectured widely, wrote books on yoga, and started the Self-Realization Fellowship, an organization dedicated to teaching the art of Kriya yoga to Westerners. Yogananda's spiritual experiences fit into two general categories: the yogic type which focuses on the experience of "cosmic consciousness" and altered perception, and the devotional type which focuses on worship of deities. The emphasis in the following section of the biography is on Yogananda's spiritual experiences. The first three experiences mentioned here are of the yogic type. In the first, Yogananda has just returned to visit his teacher from an unsanctioned trip to the Himalayan mountains. After apologizing to his teacher for making the trip without his permission, Yogananda went off to meditate, but his thoughts were uncontrollable "like leaves in a storm". His teacher sensed his mind was disturbed and called him back, expressing sympathy that his trip to the mountains did not produce any tangible spiritual results. The teacher then comfortingly said "your heart's desire will be fulfilled" and struck him gently on the chest above the heart. Yogananda described his experience in the following words. Yogananda described his initiation into Kriya yoga by his guru in this third yogic experience. Master possessed a transforming power; at his touch a great light broke upon my being, like a glory of countless blazing suns together. A flood of ineffable bliss overwhelmed my heart to the innermost core. Yogananda wrote later that his guru Sri Yukteswar taught him "how to summon the blessed experience at will, and also to transmit it to others" when their intuitive channels were developed. The second type of experience mentioned by Yogananda is devotional in nature. In this experience, he had a vision while meditating on a statue of the goddess Kali in the Dakshineswar temple. This is the temple near Calcutta where the noted nineteenth century saint Ramakrishna Paramahamsa worshiped and had many visions of the divine mother in the form of the goddess Kali. Yogananda's sister had complained to him that her husband was ridiculing her religious practice of maintaining pictures of saints in a meditation room in their home. She told her younger brother she had great faith in him and asked for his help. Yogananda went to the temple to ask for the intercession of the "divine mother" to influence his brother-in-law to be more open and accepting of his sister's spiritual interests. He arrived at the temple at 7AM and began meditation in front of the statue of Kali. He was visualizing her inwardly, and he prayed that she would appear before him in a vision. By noon he had still not received a vision and the temple doors were closed, as was customary. He got up discouraged and walked into the courtyard stepping on the hot pavement. He inwardly addressed the divine mother saying he wanted to offer a prayer to her on behalf of his brother-in-law, but the statue was now hidden from his view with the closing of the temple doors. He describes the vision that followed. "My inward petition was instantly acknowledged. First a delightful cool wave descended under my back and over my feet, banishing all discomfort. Then, to my amazement, the temple became greatly magnified. Its large door opened slowly, revealing the stone figure of the goddess Kali. Gradually the statue changed into a living form, smiling, nodding in greeting, thrilling me with joy indescribable. As if by a mystic syringe, the breath was withdrawn from my lungs; my body became very still, though not inert. Yogananda goes on to describe how only the goddess statue and the temple were enlarged, how his body seemed to be "composed of some ethereal substance", and how he could read his companions thoughts when he gazed at him through the now transparent temple walls. At this point, Yogananda addressed Kali asking her that his sister's husband be changed spiritually. Kali spoke to grant his wish and the scene changed back to normal. Someone from the temple staff then offered the two visitors a good meal following the vision. The brother-in-law had been angry at Yogananda for making him miss the temple lunch prior to this. After this unlikely event, the brother-in-law became pensive. 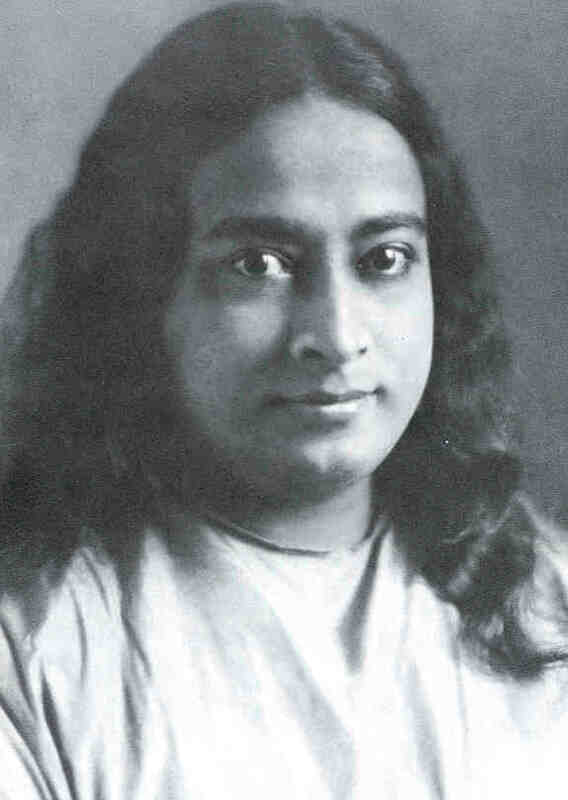 Yogananda claims his bother-in-law changed from that point on and became increasingly interested in spirituality. Yogananda described his relationship with his guru in some detail. Several chapters are devoted to descriptions of how his guru handled different situations at the Serampore ashram. Yogananda was always off doing work for his teacher, and as a result had little time for his university studies. He describes how on a variety of occasions, his guru took steps to make sure "the mad monk" as he was known at school would pass his examinations. He considered his final graduation from college a miracle considering how little time he spent in class. The guru also predicted a variety of sicknesses that would affect visitors and friends, and helped in the cure of some of them. Yogananda also described how on one occasion, his guru manifested a physical body out of thin air, and addressed him telling him about a change of plans and his coming arrival by train that evening. Yogananda became a monk and was initiated by his guru into the "Giri" or mountain branch of the Shankaracarya order, one of India's largest and most respected yogic lineages. He wrote a number of books and lectured widely in Europe and the United States before his death in 1952. His organization "The Self-Realization Fellowship" is very much alive in the United States and continues to teach thousands of students the art of Kriya yoga.